Last year for Saint Patrick’s Day, my daughter, Brenda, went back and forth between cooking a traditional Irish Lamb Stew or a Guinness Beef Stew. For her husband, the Guinness Beef Stew won out as his first choice for her to cook and they were not disappointed. She highly recommends trying the recipe! She promised herself that lamb stew would be on the menu this year. Traditionally Irish lamb stew was cooked with the cheapest and most readily-available ingredients using mutton (less tender sheep over two years of age) or lamb meat (neck bones or shanks) and root vegetables such as potatoes and onions with water. Cooking the stew over low heat for a long period would make the meat fall apart tender. Irish lamb stew is also typically cooked in a clear broth instead of a thicker stew sauce that most Americans are used to. Now days, you will also find more variety of root vegetables added to the stew such as carrots, leeks, parsnips, or turnips with barley and parsley. In both of our personal opinions, we feel onions add more flavor if they are sauteed first before cooking in a soup or stew. Since the stout beer added such a wonderful flavor to the Guinness Beef Stew, my daughter included some stout beer to deglaze the meat and onions bits stuck to the bottom of the pan for maximum flavor enhancement. She saw many recipe versions using bacon for flavoring, but decided to try out the stew with more of the core flavors. More delicious Irish recipes, check out Guinness Beef Stew, Corned Beef and Cabbage, Corned Beef Bubble and Squeak, and Irish Soda Bread. * Can substitute with 2 pounds baby potatoes. This quick and easy Homemade Chicken Stock recipe uses a cooked rotisserie chicken to save time and effort. Using a purchased supermarket rotisserie chicken is a much simpler and easier way to make homemade stock. The taste is so much better than those boxed or canned chicken stocks that you can purchase in your local grocery store. You will love this shortcut method of making homemade chicken stock. In a large 6-quart Dutch oven over medium-high heat, add olive oil and let heat for a couple minutes. While oil is heating, use a paper towel to pat dry the lamb chunks (moist meat will not brown, so this is an important step). Sprinkle the lamb with salt and pepper. Cook the lamb and bones in small batches in the Dutch oven (over-crowding meat while cooking, will prevent from browning) for a few minutes on each side, until meat is browned. Remove cooked lamb and bones, set aside to use later. Add onions and garlic to Dutch oven and saute for a few minutes until onions appear translucent; remove onions and set aside. Pour in 1 cup of stout beer and bring just to a boil. Use a spatula to scrape up the bits of leftover meat and onions stuck to the bottom of the pan. In the Dutch oven, deglazed with the beer. Add a layer of lamb meat (including bones) and onion mixture. Next, add a layer of potatoes and top potatoes with layer of carrots, leeks, and turnips. Sprinkle with salt and pepper. Add a second layer of lamb, then onion mixture and finish with carrots, leeks, and turnips on top. Sprinkle again with salt and pepper and then add thyme and bay leaves on top. Pour in the rest of the bottle of stout beer and enough chicken stock to just cover the lamb and vegetables. Bring just to a boil, turn heat down to medium low, cover with lid (leave small gap for steam to escape) and let simmer for 2 hours. *If you prefer firmer vegetables, then add to the last hour of cooking. After the 1st hour, gently stir the stew, cover with lid, and finish cooking for last hour or until meat is fall-apart tender. Salt and pepper to taste. Serve in bowls and garnish with fresh chopped parsley. As an option you can also garnish with a sprinkling of sliced leeks. Preheat oven to 325 degrees F. before prepping stew and browning meat. In the Dutch oven, deglaze with the beer. Add a layer of lamb meat (including bones) and onion mixture. Next, add a layer of potatoes and top potatoes with layer of carrots, leeks, and turnips. Sprinkle with salt and pepper. Add a second layer of lamb, then onion mixture and finish with carrots, leeks, and turnips on top. Sprinkle again with salt and pepper and add thyme and bay leaves on top. Pour in the remaining of the bottle of stout beer and enough chicken stock to just cover the lamb and vegetables. Cover tightly with lid and place in oven to bake for 2 hours. After the 1st hour, open the oven, gently stir the stew, cover with lid, close the oven, and finish cooking for the last hour until the meat is fall apart tender. Remove from the oven and salt and pepper to taste. Serve in bowls and garnish with fresh chopped parsley. As an option you can also garnish with a sprinkling of sliced leeks. Preheat slow cooker, on high heat, before starting prep work and browning meat. Pour the beer with deglazed bits from bottom of Dutch oven into the slow cooker. Add a layer of lamb meat (including bones) and onion mixture. Next, add a layer of potatoes and top potatoes with layer of carrots, leeks, and turnips. Sprinkle with salt and pepper. Add a second layer of lamb, then onion mixture, and finish with carrots, leeks, and turnips on top. Sprinkle again with salt and pepper and add thyme and bay leaves on top. Pour in the rest of the bottle of stout beer and enough chicken stock to just cover the lamb and vegetables. Cover with lid and cook on high heat for 4 to 5 hours or low heat for 8 to 10 hours or until the meat if all apart tender. Salt and pepper to taste, serve in bowls and garnish with fresh chopped parsley. As an option you can also garnish with a sprinkling of sliced leeks. Excellent accompanied with Irish Soda Bread, and a glass of stout beer. Follow initial preparation instructions at the top of the recipe, instead of browning in Dutch oven, the Instant Pot can be used instead. Press the Saute button, then the Adjust button to set to "More" heat. when the Instant Pot registers "Hot", then it's ready to add the olive oil and seasoned lamb meat and bones to brown. When the lamb is browned, remove meat and set aside. Next add the onions and saute for a few minutes until the onions are softened. Then add the garlic and chicken bouillon granules and stir together and saute for about 30 seconds until you start to smell the garlic aroma. Pour in 1 cup of stout beer and stir in with the onion mixture and scrape up any stuck bits from the bottom of the pot. Let the mixture start to come to a boil then press the Keep Warm/Cancel button to turn off the heat. Add a layer of lamb meat (including bones) then a layer of onion mixture on top of the lamb. Sprinkle with salt and pepper. Add a second layer of lamb, then onion mixture. Sprinkle again with salt and pepper and add thyme and bay leaves on top. Pour in the rest of the bottle of stout beer and enough chicken stock to just cover the lamb and onion mixture. Cover with lid and close to seal the lid. Make sure the pressure valve is closed. Press the Manual button with high pressure setting. Set the cooking time for 30 minutes. When the cooking time has completed, allow to natural pressure release for 15-20 minutes. You can then open the pressure valve to finish releasing the remaining pressure until the pin drops. *Tip- Once the vegetables are added and cooked for additional time, the lamb meat will end up with fall apart tender results. If you prefer to cook lamb longer, cook the meat for an additional 5 minutes, high pressure with a natural pressure release before moving on to adding the vegetables to cook. Remove the lid and add in the potatoes, carrots, leeks and turnips. Stir into the lamb mixture. Cover with lid and close to seal the lid. Make sure the pressure valve is closed. Press the Manual button with high pressure setting. Set the cooking time for 10 minutes. When the cooking time has completed, quick release the pressure until the pin drops. Open the lid and salt and pepper to taste, serve in bowls and garnish with fresh chopped parsley. As an option you can also garnish with a sprinkling of sliced leeks. I followed the instructions using a top stove method as I dont have a slow cooker. After the first hour, I stirred the stew as per the instructions and all the veg and potatoes dissolved into the stew which I wasnt happy about as I ended up with a very thick stew with no reminisce of any veg or potatoes 🙁 I really want to give it a 2nd try though as I was surprised it still came out tasty even though I am not a fan of stout/Guinness. I brought a very cheap 4 pack of Stout which I used and I didnt find it overpowering. The veg and potatoes should really be the last thing that go in – Id say about 15-30 mins before the lamb has been cooked. Also, you will constantly need to add water (in the stove top method) otherwise the stew/lamb will dry out. Thanks for your feedback. I have added a note on the stovetop method for people that prefer firmer vegetables to add the last hour of cooking. I also adjusted the chicken stock amount to 32 ounces with a mention to add enough chicken stock to just cover the lamb and vegetables. Then liquid should not have to be constantly added while cooking. This is absolutely delicious, I’m onto my second bowl as I write this. Definitely top of my hotpot and stew list and I will be making this again soon now that winter is on the way for Australia. Love all the flavours, melty lamb chunks, beautiful vegies all coming together perfectly with the stout. I bought a lamb leg roast, chopped it up making sure the fat was removed. And put the lamb bones in also……amazing. 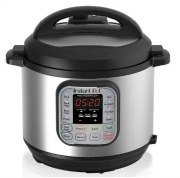 If I halve the recipe can i still use the same times for the instant pot? I have a mini so I can’t put as much in it. Also i assume i can add a roux to thicken it up after cooking? The same cooking time will work for half of the recipe. The cooking time is based on the cut sizes of your meat and vegetables.